Our original and all time best seller, the Classic Motormouse Sportscar. These superb mice come in Stunning Red, Brilliant Silver, and Gorgeous Pink. 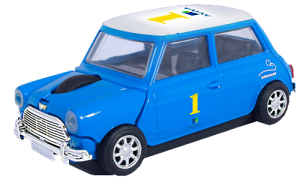 The Classic Mini, now including free Decal Sheet for only £34.99! The original Motor Mouse, the Classic Sports car was the first of our superbly manufactured mice. Comfortable, responsive and well built, this ergonomic mouse is perfect for all day use. Its chrome wheels and working headlights just add to the “wow factor” that will turn heads in the office. All of our mice can be personalised and customised to your liking. These make for great corporate gifts; perfect for employees, customers and conference participants. We can’t think of a better B2B marketing tool as your company name is always at the users fingertips! Our mice are precision manufactured and totally reliable, with fast customer support. Enquire for a free quote. As seen on BBC TV Dragons' Den ! A Motor-Mouse is built to the highest standard. We work hard with our manufacturer to ensure your product is of the highest quality, which is why we are so confident you’ll love it. We won’t sell a new product unless we are sure of its quality and accuracy. We have put a lot of time into the practicality and design of our mice. This means that it’s a very well thought out bit of kit. The batteries go into the ‘opening boot’ along with the world’s smallest 2.4ghz USB receiver. The batteries are included with the mouse. So you can store it all, in one place, we include a soft carry pouch with the mouse. And the mouse comes in a high-quality box making it the perfect present as a personal or corporate gift. Motormouse was featured on BBC TV Dragons’ Den and impressed James Caan so much that he backed the product. 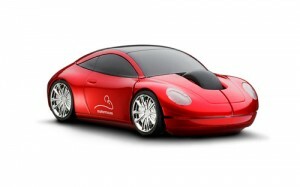 The original product was the Classic Sports Car which is still the best selling product! Following the success on Dragons’ Den the Motormouse product range has expanded to include many other car models. 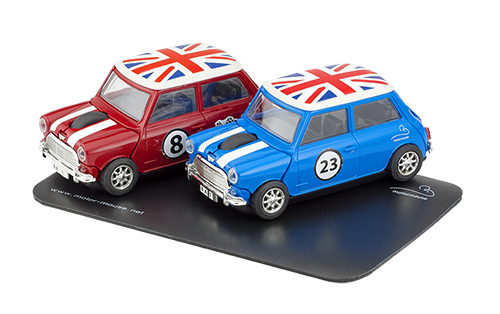 These include the Classic Mini Cooper, BMW Mini Cooper, London Taxi, and many more! We pride ourselves on our customer service and support – see the testimonials section for some of our customer feedback. We are confident your mouse will work flawlessly however, like anything, problems can from time to time occur. Should this happen to your mouse within 12 months of purchase we will repair (or replace if necessary) free of charge. For any issues we will pay for return Postage back to our head office. After the 12 month guarantee has expired we offer a repair service for a fixed fee of £15 plus VAT and postage. We also offer a spares service to allow you to replace a missing USB receiver, a new set of tyres, a matching mouse mat and many more spares! Thank you for your help I received the mouse today, very fast service thank you. Thanks a million, much appreciated. This is what I call a very good customer service.